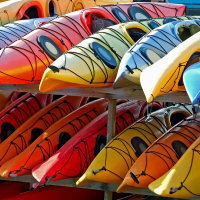 Canoes and Kayaks - the different types and which is for you? Canoes and kayaks are sometimes confused in conversation. As is explained in the box below all kayaks are actually canoes but we will generally talk about kayaks as small boats paddled with a paddle with two blades and canoes as small boats paddled with a paddle with one blade. We are often asked to clarify whether we mean a canoe or a kayak by which we are being asked are we paddling with a single bladed paddle (canoe) or a double bladed paddle (kayak). We have always said we are "going canoeing, are members of a canoe club and own canoes" however they have nearly all been paddled with a double bladed paddle. "A kind of simple, keel-less boat:" and states that "‘canoe’ is sometimes understood to be any vessel propelled by paddles"
or "A small light sort of boat or skiff propelled by paddling, used chiefly for recreation in Europe, North America, etc." and "The ordinary canoe is ...like the kayak of the Eskimos ...it is propelled by a paddle having a blade at each end; but so-called ‘Indian’ or ‘Canadian canoes’... are also in use ... and are propelled by a single-bladed paddle." "A canoe made of a framework of light wood covered with sealskins sewn together, made and used by the Inuit of Greenland and other Eskimo peoples. 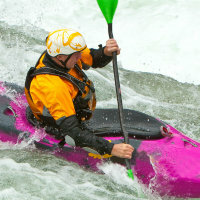 The top has an opening in the middle to admit the single kayaker, who laces the covering tightly round the body to prevent the entrance of water." In spite of this because it seems that the words are now used to define how many blades are paddled with we will try to comply! On this site, a kayak means a small boat used with a bladed paddle and a canoe will usually use a single bladed paddle except where it doesn't!!!. What Kayak or Canoe for the Conditions? 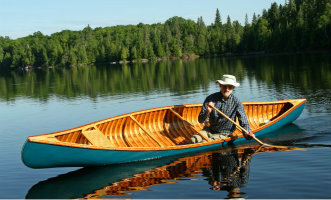 There are many different types of canoes and kayaks used for many different purposes. Some are easier to use than others and some can be used for a wide variety of types of paddling whilst others are suited to very specific situations. We go into more detail about each type of boat on its own page which you will find links to here as you read. 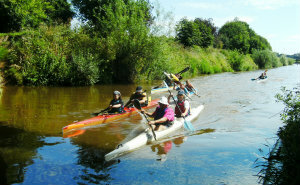 Firstly we look at the various types of water you might be paddling on and which canoes or kayaks are most suitable. If you already know what sort of boat you want to know more about scroll to the end for a list of links to different boat types. Slow moving rivers and canals lend themselves to introducing beginners to the basic paddling techniques, recreational touring and flat water race training and competition. The most appropriate boats for these activities include closed cockpit playboats, open canoes, sit-on-tops, inflatables, touring kayaks and flat water racing boats (sprint and marathon, canoes and kayaks). You might also see Dragon Boats, O1s and SUPs out enjoying our rivers. Whilst Inland lakes and estuaries can look very calm and easy to paddle on they can be quite challenging places to paddle if the wind picks up and you have chosen the wrong boat. Waves can build up to a challenging size over even quite a short fetch so when choosing a boat for this environment it is best to err on the side of the more stable boat. Typical activities are not that dissimilar to those on slow moving rivers i.e. introducing beginners to the basic paddling techniques, recreational touring and on estuaries some surf ski and / or sea paddling out into wider bays and towards the sea. Many flat water racing paddlers learn and train on this type of water but will tend to use more stable versions of racing boats when conditions are rough. Typical boats to see in use would therefore include closed cockpit playboats, sea kayaks, surf skis and more stable versions of open canoes, sit-on-tops, inflatables, touring kayaks and flat water racing boats (sprint and marathon, kayak and canoe). The faster flowing and white water rivers are the domain of the river runners in playboats or creekboats and the open candian whilst also enjoyed by the freestyle paddler and the competitive slalom paddlers and white water racers. 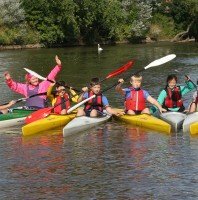 The boats primarily in use are therefore open canoes and canoe and kayak versions of playboat or creekboats, freestyle boats and squirt boats, slalom boats and white water racers. You will get away with paddling the more stable and manoeuvrable of touring kayaks on faster flowing but essentially flat water and you will see some descent races being run on faster flowing rivers often over weirs where flat water racing boats make the transition to racing down rough rivers with some inevitably spectacular capsizes along the route! 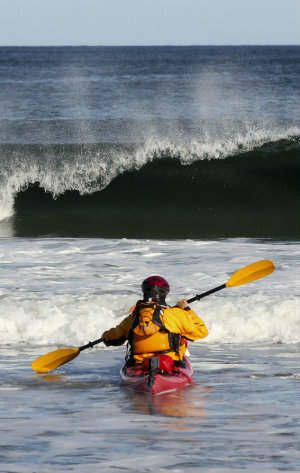 Paddling on the sea or ocean requires the right equipment and conditions can vary from flat water inlets on hot sunny days to huge ocean swells in cold winds and weather or curling surf breaking on a sandy beach. Staying close to shore on a sunny day in calm conditions similar boats to those used on our lakes and estuaries can be used with the addition of SUPs (stand up paddle boards). On a beach with surf the surfskis, surf canoes, SUPs come into their own and many playboats / creek boats will be multi purpose enough to be used to enjoy the waves coming into the beach. Further out beyond the breakers or touring beach to beach you will find the sea kayaks and surfskis at their best and providing the most effective means of getting from A to B although you can have plenty of fun paddling from bay to bay and shorter distances in the play boat or creek boat and on Sit-on-Tops in reasonably calm conditions. "A kind of simple, keelless boat:" and states that "‘canoe’ is sometimes understood to be any vessel propelled by paddles"
or "A small light sort of boat or skiff propelled by paddling, used chiefly for recreation in Europe, North America, etc." and "The ordinary canoe is ...like the kayak of the Eskimoes ...it is propelled by a paddle having a blade at each end; but so-called ‘Indian’ or ‘Canadian canoes’... are also in use ... and are propelled by a single-bladed paddle." Click here to read about the essential elements of shape, design and construction that influence how canoes and kayaks perform. If the link is not doing anything yet the page is on our "to do list"